On the 28th of January 2015 the cargo ship Floreana ran aground just off Baquerizo Moreno. En-route from San Cristobal to Puerto Ayora, the ship was carrying 1,400 tons of cargo consisting of mostly food and gas cylinders. Holding 50 tons of fuel, authorities have set up oil booms as a precaution whilst authorities attempt to remove the fuel as quickly as possible. In order to protect the Galapagos’s ecosystem a contingency plan was implemented immediately with specific focus put on protection of the surrounding environment. However, this is not an isolated event being the 3rd cargo ship to run aground over the past year. Previously, on the 9th of May 2014 another cargo ship (the Galapaface I), holding approximately 10 tons of cargo and 19,000 gallons of diesel fuel, became stuck just off Punta Carola, San Cristobal. Being identified by the Ecuadorian government as a state of emergency to fast track response efforts, the Galapaface I initially had oil booms positioned around the ship, which was followed by steel buoys being welded to its hull in order to re-float the ship. On the 15th of July 2014 the Galapaface I was stabilised and moved away from the Galapagos Marine Reserve (GMR). Indicating the potential threats to the Galapagos Archipelago from cargo vessels. Although the Galapaface I had a positive outcome the Ecuadorian government’s decision to declare this a state of emergency for the Galapagos ecosystem demonstrates the governments fear of the disastrous consequences a oil spill could create. 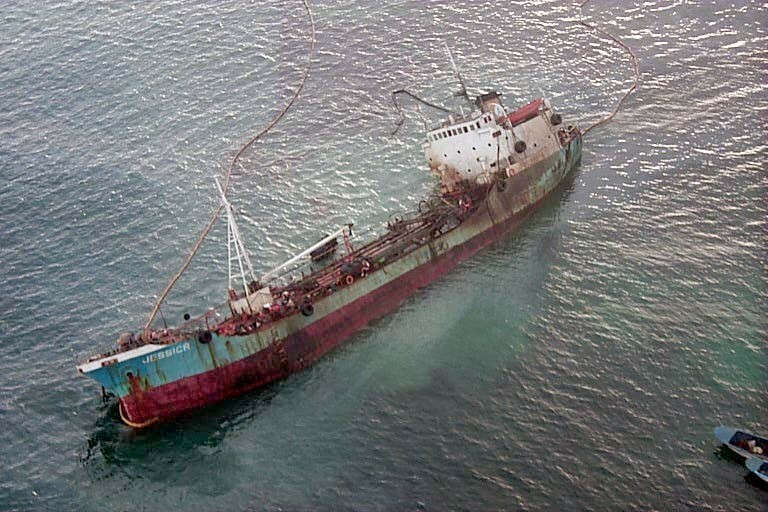 This was experienced by the oil tanker Jessica which ran aground on the 17th of January 2001 just off San Cristobal Island. Spilling almost all of its 240,000 gallons of fuel, this oil spill had a significant impact on the Galapagos Islands famous wildlife. Overall, the most significant impacts were on Marine iguanas with 60% of the population perishing, attributed to the stress caused, but also animals such as Sea lions and many other marine species were noted as experiencing losses. This oil spill would have undoubtedly led to such quick actions being taken during subsequent incidents of grounded vessels. With the Galapagos Islands being such an important location for endemic species it is imperative incidents like these are minimised to reduce risk to the already fragile ecosystem. Categories: Human History | Tags: cargo, jesssica, oil spill. ¡Qué pesar! Espero que lo arreglan con rapidez.